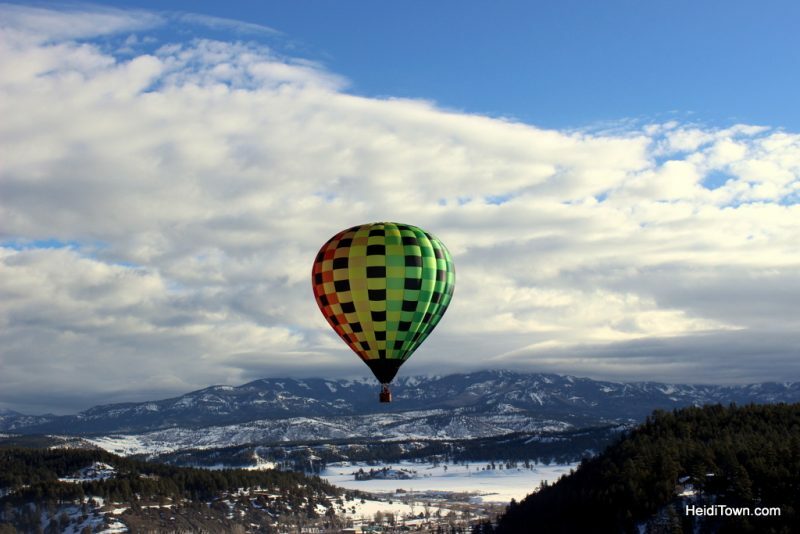 Hot air ballooning is a bucket list activity for many of you, and if you are lucky enough to live in or visit Colorado, it’s relatively easy to book a ride in a hot air balloon. 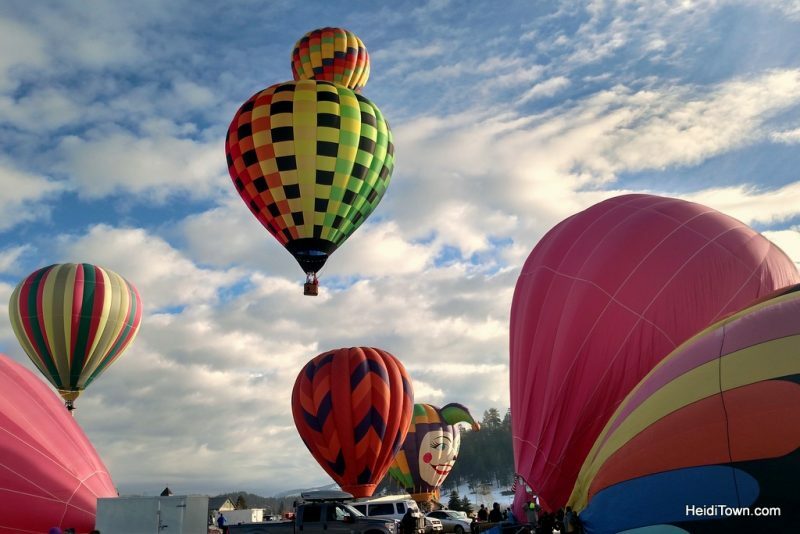 In fact, you’ll find commercial hot air balloon outfitters in many beautiful destinations from Steamboat Springs to Pagosa Springs. Earlier this month, Ryan and I attended Winterfest in Pagosa Springs. 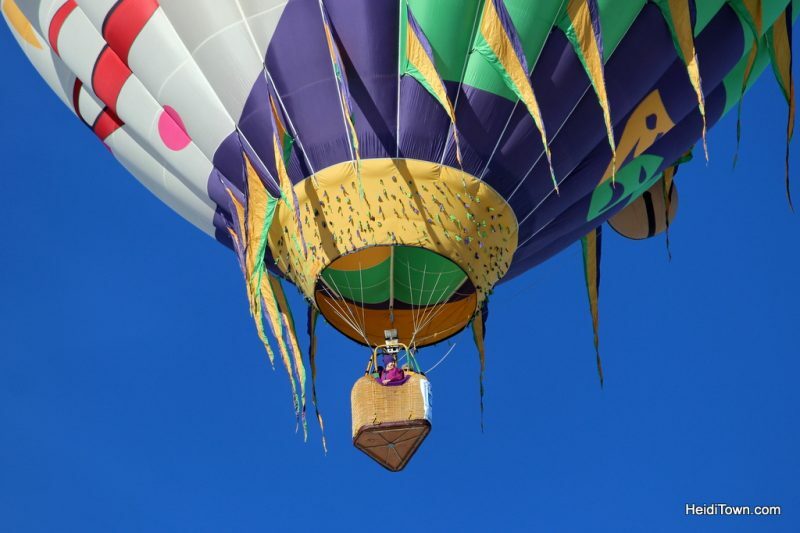 For years, a hot air balloon ascension has been part of this event, and I managed to hitch a balloon ride with the Dickey brothers from Albuquerque, New Mexico. It turns out, I couldn’t have been in better hands. These brothers, Frank and Bill Dickey, have decades of hot air balloon piloting experience. And in fact, the Dickey brothers have come in first and second at the piloting championships held at the Albuquerque International Balloon Fiesta, the world’s largest hot air balloon festival. Ryan up in the 2nd Wind. For the participants, a hot air balloon event is a lot of work, a little flying and lot of tailgating. It’s a family and friends affair due to the fact that a balloon needs at least four people to help get it unpacked, up in the air, back down on the ground and packed away. 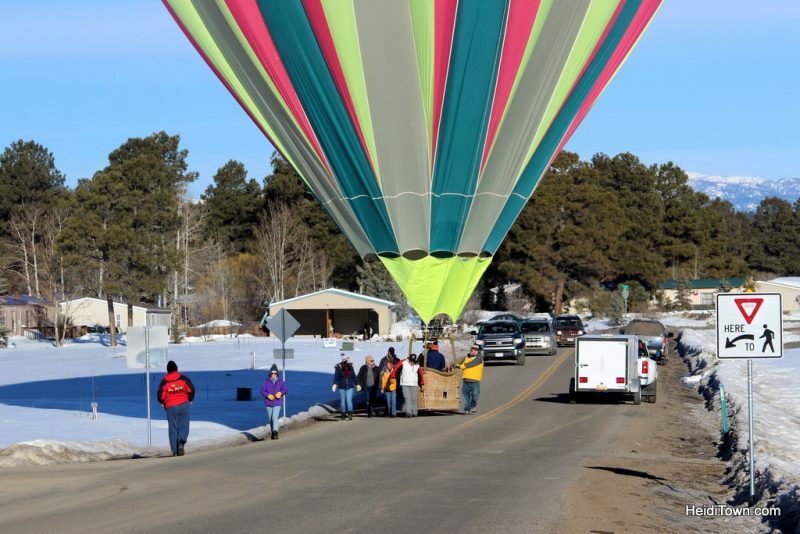 A Winterfest record number of 19 balloons were scheduled to go up on two mornings in Pagosa Springs. After a pilot briefing at the Visitor Center, which involved a discussion of weather and other logistics, the teams headed out to an open space in downtown Pagosa near the San Juan River. I felt like a kid as I stood on the frozen ground watching in awe as enormous, colorful balloons materialized around me. Once a balloon begins to fill with propane, it stands upright surprisingly fast. Before I knew it, balloons were hovering all around the park; some rose quickly while others moved more slowly. It’s a bit like watching a big balloon waltz. I was going up in the 2nd Wind, with Bill and his daughter, Kelly Dickey, who was celebrating her birthday. Kelly’s parents, Bill and Carol, met through ballooning, as did Frank and his wife Nikki Byrd-Dickey. I climbed, a bit awkwardly, into the basket, and at some point, we were airborne, although I’m not exactly sure when we left the ground. This is because there’s a huge difference between flying and floating. When a plane lifts off you can feel it in the pit of your stomach, but hot air balloons have a much more gentle ascent because they float as opposed to fly. And I think it’s the floating that makes a hot air balloon ride so magical. When the pilot isn’t burning the propane to keep the balloon afloat, it’s an incredibly quiet ride, which only adds to the enchantment of hot air ballooning. This is the point in this article where I’m going to reveal a secret that some of you already know – I’m deathly afraid of heights. 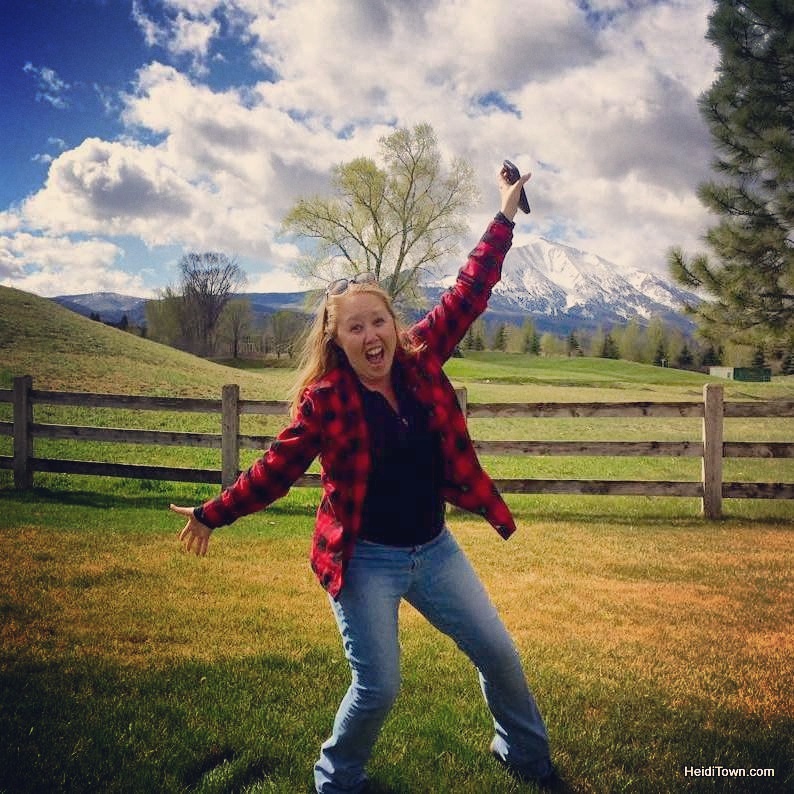 I push myself to do things like zip lining and ice climbing because I want to write about these activities. After all, fear is good fodder for stories. 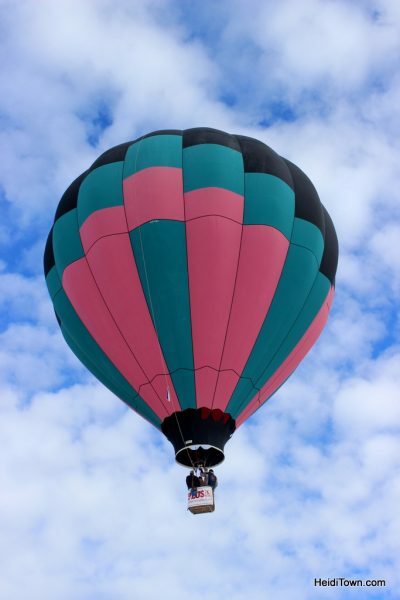 My first experience in a hot air balloon was years ago at the Sweetheart Balloon Rally in Loveland, Colorado. I was downright terrified as we floated high above Larimer County, covering quite a few miles and landing not so softly in neighborhood park near a lake. 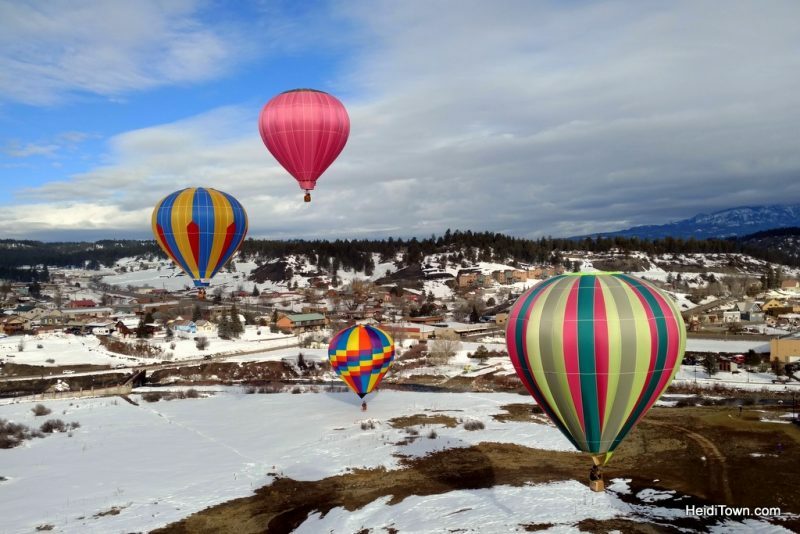 As we floated above Pagosa Springs in 2nd Wind, I looked down on the town, out at the mountains and watched the balloons slowly rise and fall around us. My emotions continually shifted from a strange inner peace to sheer terror and then back to peace. Bill Dickey kept me entertained with ballooning stories; some were reassuring and others were not, but it was his skill at keeping our balloon above the park that was most comforting. Before this balloon ride, I didn’t realize that it was possible to pilot a hot air balloon up and back to nearly the same spot on the ground where the balloon started. Flying back and forth over the same area by using winds of opposite directions at different altitudes is called, in balloon terminology, a “box.” Pagosa Springs’ valley location, in addition to the warm air currents created by the town’s hot springs, make it a great place to fly a “box.” Of course, high winds can change everything, but we had perfect weather on our Saturday morning outing. Once we were back on the snowy ground, less than 50 yards from where we’d taken off, Ryan climbed in for a short ride while I chatted with Frank Dickey. These two brothers are a wealth of ballooning information and quotes. My favorite, and a favorite of ballooners, is: there are bold pilots and old pilots, but no bold old pilots. There’s no ambiguity in that quote and it says a lot about the kind of people who balloon. This is not an extreme sport. It’s been around for more than 200 years, and requires an enormous amount of patience to learn the skills required to be hot air balloon pilot. Meeting the Dickey brothers was a highlight of my HeidiTown travels. I love their zeal for ballooning and I especially appreciate their ballooning know-how. 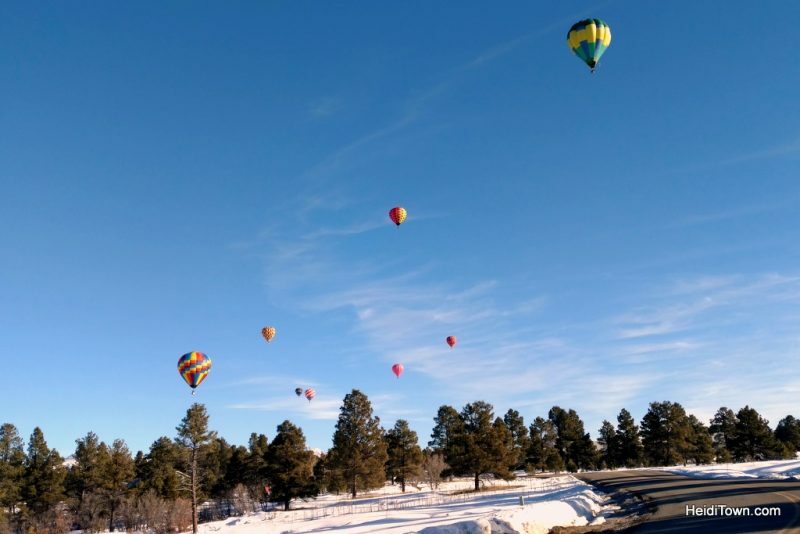 The next morning, after their pilot briefing in uptown Pagosa Springs, the balloons launched from various areas. We found six setting up in the recreation center parking lot near Wyndham Pagosa. This time they didn’t fly a “box,” but rather drifted with the winds in a westerly direction. Traffic jam in Pagosa Springs. They were landing, not taking off! This time I was set to shoot instead of ride, and we had a great time chasing the balloons around in our car and capturing up to eight in the same photograph. 1, 2, 3, 4, 5, 6, 7 & EIGHT! Winterfest occurs annually in Pagosa Springs and is organized by the local Chamber of Commerce. In addition to the balloon ascension, there are sled races, a polar plunge and more. It’s a great time to visit Pagosa Springs, Colorado. For a comprehensive list of balloon festivals in Colorado and beyond, visit HotAirBalloon.com. 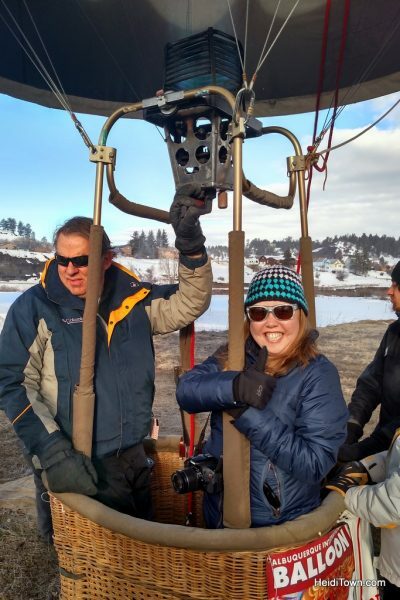 Thank you to Visit Pagosa Springs for hosting us on this trip and thank you to the Dickey brothers for a wonderful hot air ballooning experience. Thank you. Another bucket list idea! Such a fun event. Lucky for you there are balloon fests all across Colorado, so it’s not hard to find one. Although 19 balloons is more than I’ve seen at any festival in the state so far. Thanks so much for stopping by town this week! oh my gosh, Connie! That’s funny. Happy you found the blog post. We had such a great time. In fact, I want to do more balloon festivals now and may even be in Albuquerque in October. Maybe I’ll see you there? Thank you so much for stopping by HeidiTown!